Beds24 are our partners who provide Channel Management functionality to Jomres. Taking this approach allows us to focus on our core product, Jomres, and helps us to keep the price of it low, whist Channel Management experts can focus on their specialisation. The V1 and V2 plugins use almost exactly the same tables, but the V2 plugin adds a new table for cross referencing Jomres properties with Beds24 properties. This means that if you are going to move from V1 to V2 you will need to ensure that your property managers visit the Settings -> Channel Manager page in the frontend so that existing relationships can be re-established. More on this later. First things first, you MUST uninstall the older Beds24 plugin through the Jomres Plugin Manager if you already have it installed. You must be running at least Jomres 9.9.7 as the older API Core and Webhooks plugins have been integrated in to Jomres Core and are no longer available through the Jomres plugin manager. Before you continue you should click the green button, which will give all of your existing property managers new API keys. This is an essential action and must be done immediately if you've never used this plugin before. If, on the other hand, your users have already been using the older V1 plugin click the Ignore button instead as the plugin will be able to auto-populate the property mapping table when your managers view the Channel Manager page in the frontend. Ok, the next thing to do is to log into the frontend of your Jomres installation as a property manager. 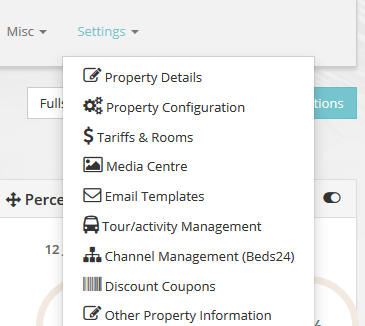 Click on Channel Management (Beds24) to start linking your properties with any existing properties in Beds24's service. Do as it says and copy and paste the key into the Link field in Beds24's service from another tab, then return to this tab and click Next. This is where you link your properties in Jomres with your properties in Beds24. If you already had properties linked using the V1 of the plugin then Jomres should find those properties, see that their API keys already match and link them automatically. Using the dropdowns select the Jomres room types you want to associate with the room types from Beds24 and click Save. Jomres will now import all of the data required and create a new property. Once this has been done you will be taken back to the Property linking page. As you can see, the properties on the two systems have been mapped to each other. Let's click on the View Property button and see what that gives us. This new page has several sections to it. Let's look at it in more details. The first section will look familiar. It's essentially the same as the one you saw when importing the property and it allows you to fix room type associations if you've had to add or remove room types for whatever reason. The first area here is the Notification url. Beds24 need to know this so that they can send your Jomres installation notifications about new bookings. If you upgraded from V1 of this plugin, or if you imported this property then you will need to go to your Beds24 control panel and change the notification url to that shown on the page. Finally, you will see buttons that allow you to import and export bookings. You only need to do this once after you have linked the properties. Afterwards any newly created bookings should be imported and exported automatically. As this particular property was imported from Beds24, I would now need to import any existing bookings into Jomres too. That's it! That's all you need to do to link properties! Why do you need a Channel Manager? Channel Managers are services which are specifically designed to receive information about bookings in one OTA ( for example booking.com ) and forward that booking information on to other OTAs that you have connected to the service. Because different OTAs speak different "languages" each connection needs to be specially written to talk to that OTA. The advantage of this kind of service is that it allows one OTA to update all other connected OTAs thereby preventing ( or at least reducing the risk of ) double bookings. You may be using Jomres as your PMS ( Property Management Service ) but in this context, Jomres is effectively another channel, or OTA. To allow Jomres to talk to the Beds24 Channel Manager, and the Channel Manager to talk to Jomres, you need the Beds24 plugin for Jomres. What's the difference between the V1 Beds24 plugin and V2? The V1 plugin was written 3 years ago, and like everything else in IT 3 years is an awfully long time. Since the first iteration of the plugin we have added lots of new features to Jomres, including the dynamic dashboard and the ability to drag and drop bookings around to modify them and change their status. Unfortunately, due to the complexity of the original Beds24 plugin, it wasn't easy to integrate the new Jomres Core functionality with the older plugin, meaning that every time we added a new feature to Jomres users would find that only certain information might be being updated to Beds24. I built some work arounds for this, but they were just that, workarounds that were quite frankly rather ugly and clunky to maintain. One of the newer features I've been working on over the last year is the Jomres REST API & Webhook functionality. The Webhook feature is designed to fire when certain tasks are done within Jomres, including creating a booking. The works exceptionally well and is great for things like sending notifications to teams etc when something has been done and it's ideal for triggering notifications to channel managers on booking creation. Everything. The V2 is a complete rewrite of the features required to talk to the Beds24 Channel Manager. It uses the newly developed features of the REST API and Webhooks and gives us a much more robust and fault tolerant plugin. That's something you need when you're trying to avoid double bookings.